I am very conservative; it is only the natural Discus I truly like and wants to working with. 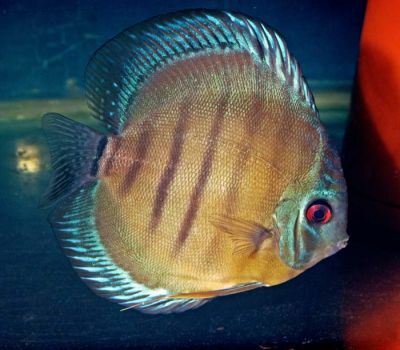 I was only working with original Discus before 1981 and this beautiful brown blue head Discus was the first to lay eggs in my aquarium in 1981. Most of the information I am written about in my discus pages is my experience with discus from 1971, discus articles on internet, information from legal scientific sources and of course from my main information source, Heiko Bleher in his book, articles and answer he have given on internet about discus. You give me very much new information in your wonderful book, but some time I wonder and in this issue you give me very good answer. I have been working with Discus since 1971, but you give me new information in your book I have been wonder for many years, very often in every pages. I have never seen a book about nature and animals like yours, you have given a big contribution to history and the description of a biotope how can be destroyed and disappeared in may be the next generation. Your book is a testament of the nature we know today with your knowledge’s. I inside me I crying when I think this stupid Humans working in Amazonas can destroy may be the garden of the Eden for the world and the humans . It is hard to think about this, but the interest for the Discus gives me this information. We need explores like you, thank very much for what you gives all of us. Your book is more than a book about beautiful fishes and their habitats, it also describe a nature how blending the reader and I know I have to teach my children to love and give contribution to take care of this beautiful nature. This is also the vision your book also gives me. Then why I think it is not possible for others to write a book like this. It is written by human how loves and have lived with the nature and the animals in it for the most of his life. I feel that your soul is a part of this book and that’s why is so interesting to read, it is also a documentation of the life of the explorer and his offspring. When I read your book I begin to ask my self more and more questions. I ask you and you give me answer, this is a great experience and inspiration for me. You are relay a great human and it is a big pleasure to have your answer. Thank you very much Heiko. My knowledge’s about discus have to levels, before I read the book Bleher's Discus I and after when I beginning to understand very much about what he was telling about. Heiko Bleher is the biggest explorer, scientist and biologic in my eyes in the term of telling, reporting, giving information, writing and make photos of the offspring of the aquatic world we have in our aquariums. What a explorer and scientist! His new Taxonomic revision of the discus spices from 2007 is splendid and gives me a clearer picture of the discus spices in the nature. The taxonomy before was very confused with the main and sub spices how was wrong described. Today it is also scientific described that this tree spices with all the local variants all over the Amazonas have its origin in a prehistoric discus spice how was bigger. Contrary to the hypothesis proposed by Ready et al. 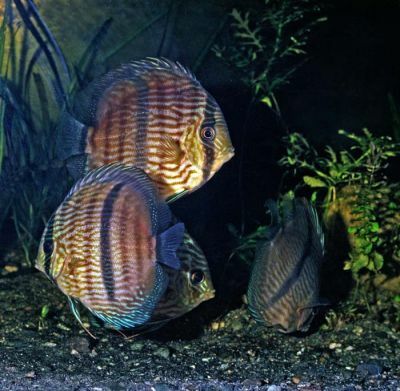 (2006), we believe that S. discus (Heckel Discus) is probably the oldest species. 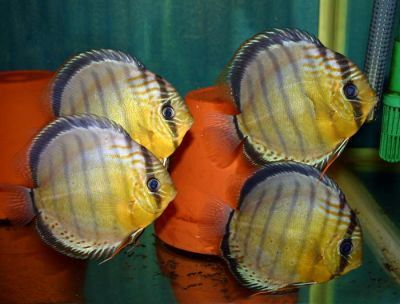 The S. discus could have hybridized with an ancestral Discus species that may now be extinct. The hybridization could have triggered the movement of mobile elements, causing multiple chromosomal rearrangements (such as translocations) that led to the original meiotic chromosomal chain. The diversification of S. aequifasciatus and S. haraldi could have occurred at 5 or 3 Mya when the Caravari and Purus arches were formed, respectively (Hoorn et al.,1995; Irion et al., 1995; Lundberg et al., 1998) (Figure 1). The current subterranean arch (Purus or Caravari) may have acted as a temporary barrier in the ancient populations that would have allowed for species differentiation following the fragmentation of their zones of distribution. Thus, the ancestral S. aequifasciatus and S. haraldi populations could subsequently have come into secondary contact. What I understand from this report is this tree spices is very close related to each other in genetic terms, but S. discus is closer to S.haraldi then S. aequifasciatus how is most fare from both of them. But all the tree spices are still so close to each other in genetic terms that the evolution line of these tree different spices are one way and will in the future give much more genetic difference. So the taxonomy model of Heiko Bleher in tree discus spices looks are to be the most scientific and logical solution for the description of discus in tree variants how is in evolution to be genetic tree different spices. What is most important is the difference in water quality and environmentally habitat this tree discus spices living under in the nature.This is what Heiko Bleher telling very much about and why this tree spices in aquarium not should be mixed together. The demand to the water quality is so different that they not will flourish in the same water in a aquarium. They need the water quality given for each spice. In Lesson 11 Heiko Bleher are written about water quality. 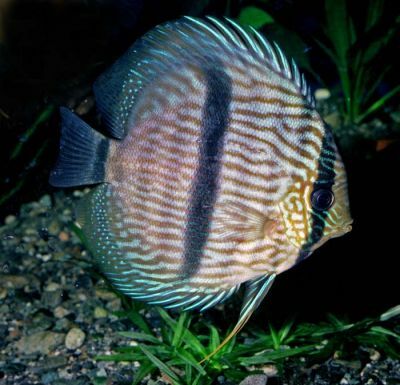 Keep brown and blue discus together if you want but do NEVER mix those wilds with anyone of the two species the above. But Bleher say also don't ever mix this wilds species with manmade discus. We have very much to learn from Heiko Bleher and his book Bleher's Discus I is the most important reference for all how wants to work with wild discus and give them the right conditions that will show you the natural color, pattern, behavior and you will see one of the most beautiful tropical fishes close to your eyes. Living in the most extreme black water conditions with pH 4.0-5.5, dH < 3, kH < 1 and conductivity 15 - 35 mikrosimens. This is a fish how demand strong acid water quality and shall not be mixed with the other discus species or manmade discus variants to flourish in an aquarium. The immunity limit of this spice is also quite different from the manmade discus, how often have Gyrodactylus a parasite how can be very devastated for the wild discus. Gyrodactylus is not living in the natural habit for the discus spices in Amazonas, that get this parasite when they enter infected aquariums. Living in the most black water conditions with pH 5.0-6.5, dH < 3, kH < 1 and conductivity 15 - 35 mikrosimens. 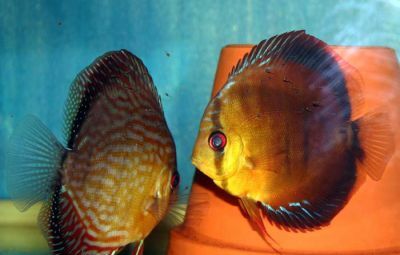 This is a fish how demand acid water quality and shall not be mixed with the other discus species or manmade discus variants to flourish in an aquarium. The immunity limit of this specie is also quite different from the manmade discus, how often have Gyrodactylus a parasite how can be very devastated for the wild discus. Gyrodactylus is not living in the natural habit for the discus spices in Amazonas, that get this parasite when they enter infected aquariums. Living in the white water conditions with pH 5.5 – 7,5, dH < 3, kH < 1 and conductivity 80 - 150 mikrosimens. This is the most common water quality all over the world and S. Haraldi is the most common discus species to have been breed in aquarium. Most of hybrids and manmade discus is from this specie. 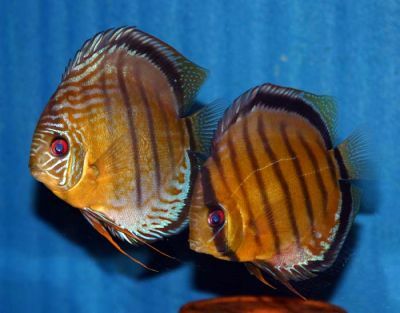 This is a fish how demand good water quality and shall not be mixed with the other discus species or manmade discus variants to flourish in an aquarium. 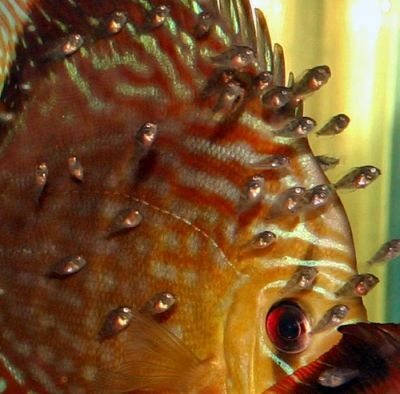 The immunity limit of this speices is also quite different from the manmade discus, how often have Gyrodactylus a parasite how can be very devastated for the wild discus. Gyrodactylus is not living in the natural habit for the discus speices in Amazonas, that get this parasite when they enter infected aquariums. Today, there have been 35157 visitors (90853 hits) on this page!